The Revenue Sharing Agreement refers to a 1982 legal agreement between the City of Charlottesville and Albemarle County that prohibits annexation efforts by the city in exchange for a share of the county's revenue. (c) the agreement would continue indefinitely. This description of the revenue sharing agreement between the City of Charlottesville and Albemarle County appears in Albemarle's annual budget. An Annexation and Revenue Sharing Agreement, dated February 17, 1982, between the County of Albemarle and the City of Charlottesville was approved in a public referendum on May 18, 1982. The agreement required the County and the City to annually contribute portions of their respective real property tax bases and revenues to a Revenue and Economic Growth Sharing Fund. Distribution of the fund and the resulting net transfer of funds will each be made on January 31 while this agreement remains in effect. The County and City mutually agree to cancel or change the agreement. Q: What is the Revenue Sharing Agreement? A: In 1982, Albemarle County and the City of Charlottesville entered into a revenue sharing agreement in which both jurisdictions agreed to share tax revenues in return for total immunity from any annexation attempts by the City. The City was proposing a significant annexation of County territory at that time to increase the City tax base. The proposed agreement was approved by County voters in a referendum. For as long as the agreement remains in effect, both the County and the City are required to contribute annually to a Revenue and Economic Growth Sharing Fund which is then divided between them on the basis of a formula related to population changes and “true real property tax rates” as determined by the Virginia Department of Taxation. Due to the nature of the formula and the conditions in the City and the County since 1982, the effect of the agreement is that the County has paid the City a revenue sharing amount every year equivalent to the ten cent tax rate cap., the revenue sharing payment totaled $18.4 million, this year we anticipate that the revenue sharing payment will decrease by $365,000 to a total of $18 million. This is the first decrease in revenue sharing since the agreement was established in 1982. Q: Can the County discontinue the Revenue Sharing Agreement? A: The Revenue Sharing Agreement is legally binding and must remain in effect until one of the following occurs: The City and County are consolidated or otherwise combined into a single political subdivision, or The concept of independent cities is altered by state law in such manner that real property in the City becomes part of the County tax base, or The City and County agree to cancel or change the agreement. 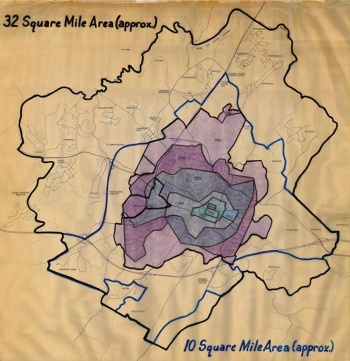 Chapter 84 of the Acts of Assembly of 1970 was the charter for the merger of the City of Charlottesville and Albemarle County, provided the consolidation agreement was ratified and approved. The consolidation agreement did not pass; therefore, the charter is not in effect. "Revenue Sharing with the City of Charlottesville: In FY 09/10 paid $18,038,878 to the City of Charlottesville in fulfillment of the revenue sharing agreement provisions, an increase of $4.4 million over the FY 08/09 payment. This payment is at the agreed-upon cap of 10% of the total assessed property values based on the 2007 calendar year." Between the 1982-83 and the 2009-10 budgets, Albemarle County has transferred $160,803,093 to the City of Charlottesville. The composite index, the formula that determines state funding to Albemarle County, does not take into account the revenue sharing agreement. Albemarle is thus assumed in the state budget to have more local revenue than it actually does, and as a result, receives less revenues from the state in each biennial budget. Real estate assessments in Albemarle County, for the purposes of this agreement, are calculated at the full value and not the land use value. Thus for properties getting the land use tax subsidy, Albemarle pays more to Charlottesville than it collects from the property owners. Even though the Virginia General Assembly has maintained a moratorium on annexations since the 1980s, Albemarle can never exit the revenue sharing agreement without the City's consent (or until such a time that the City reverts to a town within Albemarle County). However, those talks stalled and the Board of Supervisors directed Bell to reintroduce the amendment in the 2012 General Assembly. Supervisor Dennis Rooker, who voted against the idea in 2010, changed his mind after negotiations failed. ↑ Web. Revenue sharing -- how it came to this, Daugherty, Virginia, Elizabeth B. Gleason, and Nancy O'Brien, Daily Progress, World Media Enterprises, March 21, 2010, retrieved October 4, 2018. ↑ 4.0 4.1 Albemarle County. County Executive. FY 09/10 RECOMMENDED OPERATING BUDGET. 18 Feb 2009. 5 May 2009: 173 <http://www.albemarle.org/upload/images/forms_center/departments/budget/forms/FY10_Recommended_O_Non_Departmental.pdf>. ↑ Web. Charlottesville City Council meeting minutes, .pdf, Council Chambers, City of Charlottesville, March 15, 1982. ↑ Albemarle County. County Executive. FY 09/10 RECOMMENDED OPERATING BUDGET. 18 Feb 2009. 5 May 2009: 174 <http://www.albemarle.org/upload/images/forms_center/departments/budget/forms/FY10_Recommended_O_Non_Departmental.pdf>. ↑ "Meeting of the Revenue Sharing/Annexation Agreement and the Local Composite Index Committee." Letter. 27 Aug. 2010. Charlottesville Tomorrow's Online Document Storage. Web. 27 Aug. 2010. <http://www.cvilletomorrow.org/docs/20100827-Joint-Statement-Revenue-Sharing.pdf>. ↑ Web. Closed city-county meetings questioned, Brandon Shulleeta, Daily Progress, Media General, August 29, 2018, retrieved October 4, 2018. ↑ Web. City, county put service consolidation dreams on hold, Chiara Canzi, C-VILLE Weekly, Portico Publications, April 12, 2012, retrieved April 12, 2012. Print. April 12, 2012 . ↑ Web. City-county school funding saga continues, Matt Deegan, C-VILLE Weekly, Portico Publications, January 17, 2012, retrieved October 4, 2018. Print. January 17, 2012 page 24.03. This page was last edited on 26 February 2019, at 14:02.